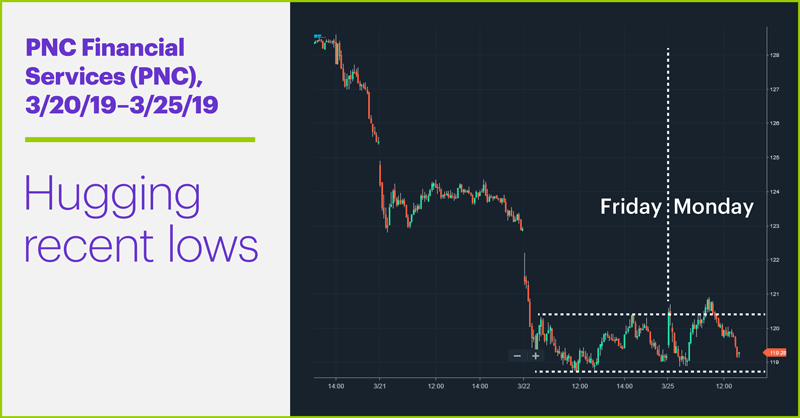 If short-term traders always need to be ready to work either side of the market as opportunity allows, PNC Financial Services (PNC) likely gave bulls and bears plenty to consider yesterday. But when the broad market opened lower yesterday—with financials leading the downside charge—PNC was in the green. The final candle in the chart above shows the stock up around 1.1% a couple of hours into the trading session, when the S&P 500 (SPX) was up only 0.2% or so. At the same time, other banking stocks, including JPMorgan Chase (JPM), Citi (C), and Wells Fargo (WFC), had trimmed their losses considerably. Because a high P/C ratio is sometimes a contrarian indicator at market bottoms—nervous traders often pile into put options during sharp sell-offs—some traders may have interpreted yesterday’s reading in PNC as bullish signal, especially since the stock was up on the day and the stock's down move had stalled around the support level defined by the February lows (approximately $119.40). Time for a “relief rally” after a possibly excessive drop? Perhaps. 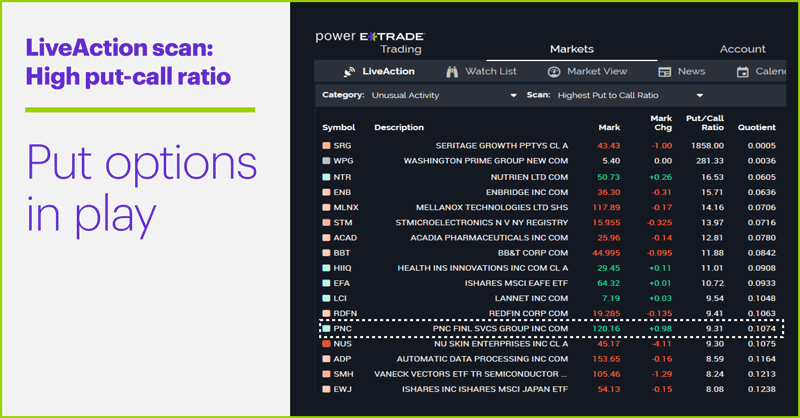 But it also turned out that most of yesterday’s put volume (1,500 contracts, representing 150,000 shares of stock) was in the $117 options expiring this Friday. So, this means a put buyer may have been expecting a big down move in the next few days, while a seller was willing to collect the premium ($135,000 in this case, as the contracts traded at 0.9, or $90 each) and take the risk that such a sell-off wouldn’t occur. Which one will be correct? Good question, and it’s also worth considering that the implications of this trade don’t extend beyond this Friday. Yesterday’s early stabilization in banks could have been interpreted as a sign that banks are due for at least a temporary rebound, even if they eventually move lower. But it’s worth pointing out that, after their initial rebounds from their early lows yesterday, bank stocks were again drifting lower (along with the broad market) as the halfway point of the trading session approached, and PNC fell into negative territory for the day. The five-minute chart above shows PNC—despite trading sharply higher early yesterday—was still within the rough confines of a consolidation (trading range) that formed after the stock hit its lows on Friday. Those lows are more or less the same as the support level shown on the daily chart. In the absence of more immediate upside momentum, short-side traders could by looking for a breakdown below that level to trigger a potential challenge to the stock’s December lows. 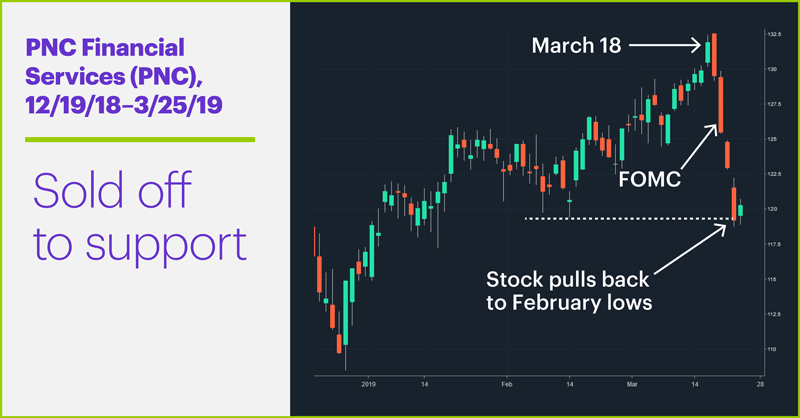 Market Mover Update: Housing stocks again bucked market weakness yesterday, with many high-profile homebuilders, including Lennar (LEN), KB Home (KBH), and DH Horton (DHI), gaining 3% or more (see “Wings of the dove”). Today’s numbers (all times ET): Housing Starts (8:30 a.m.), S&P Corelogic Case-Shiller HPI (9 a.m.), FHFA House Price Index (9 a.m.), Consumer Confidence (10 a.m.). Today’s earnings include: Cronos Group (CRON), FactSet (FDS), McCormick (MKC), KB Home (KBH), Ollie's Bargain Outlet (OLLI). A Friday yield-curve inversion takes some of the starch out of a Fed-fueled rally.